Former FBI Director James Comey's new book is called A Higher Loyalty: Truth, Lies, And Leadership. In his new book, A Higher Loyalty, Comey describes Trump as unfit for the nation's highest office, but stops short of concluding there's a strong case against the president for obstructing justice. There's some evidence of it, though, he said, citing his surprise dismissal in May 2017 after the president asked him to go easy on an investigation of former national security adviser Michael Flynn. "Never. I will never run for office, not even a close call," Comey said. Muthoni Muturi, Miranda Kennedy and Taylor Haney edited and produced this story for broadcast. Nicole Cohen produced it for the Web. We've been questioning former FBI Director James Comey. He walked into our studios here last night. Hard to miss him in the lobby, the guy who's 6-foot-8. He wore a jacket but no tie. Comey writes in a new book that as FBI director, he encouraged less formal dress, saying it puts people at ease to talk frankly. We had a frank talk about the decisions he made as FBI director. So you've made it clear that one of your goals was to protect the integrity of the FBI and the Justice Department. Did you? COMEY: I think better than the alternative, yes. INSKEEP: Do you think the FBI's credibility is better or worse than it was a couple of years ago? INSKEEP: But, he says, not as bad as it would've been had he chosen differently in 2016. Comey's book, "A Higher Loyalty," recounts the investigation of Hillary Clinton's use of a private email server. In two different episodes, Comey made public statements about the investigation at times when the FBI would typically have stayed silent. 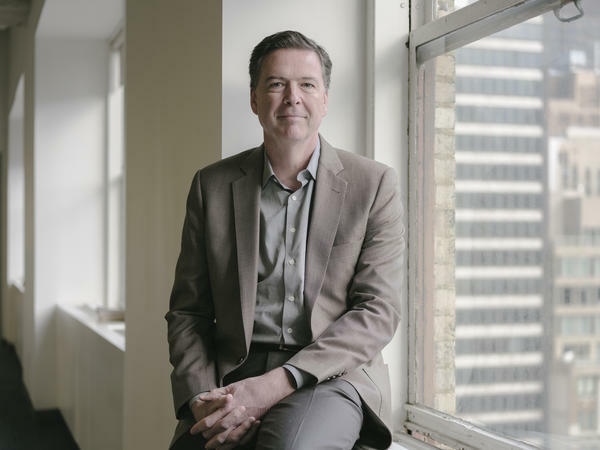 To review those decisions, we sat with Comey and an NPR colleague who's known him for years, NPR justice correspondent Carrie Johnson. CARRIE JOHNSON, BYLINE: There are people whom you respect who have leveled criticism, people like Jamie Gorelick - a Democrat, Justice Department veteran - Larry Thompson - a Republican Justice Department veteran - who after your decision to give that news conference in July 2016 wrote that you were damaging the democracy, that the department is an institution, not a person. How do you respond to that? That - those feelings have not gone away. In fact, they may have hardened since then. COMEY: Yeah. And so I try to listen to it because I could be wrong. It's a balance, right? You don't want to listen to all criticism or you'll be overwhelmed, and you'll be crushed like a grape. But you want to listen to people that you know to be thoughtful and experienced. And so I've tried to listen to it. I think if they look at it in an open-minded way, they may come away with a different view. INSKEEP: One of Comey's decisions came in July 2016. He concluded there was not enough evidence to charge the Democratic candidate with mishandling classified information, but he still held a press conference and called her extremely careless. He spoke without consulting his boss, President Obama's attorney general, and he said one question was on his mind. COMEY: How are you able to maintain public confidence that you're not a partisan, it's not the Obama Justice Department trying to give a break to Hillary Clinton? INSKEEP: So here's the thing that's on my mind, Director. The - you were hoping to demonstrate that the FBI was above political influence. Did you, in your course of action, actually allow yourself to be politically influenced? Because you write that you were concerned about criticism - essentially, conspiracy theorizing about the FBI. Were you actually being influenced by cable TV pundits in what you decided to do? COMEY: Yeah, that's a reasonable question, Steve. I don't think so, and here's why I say that. Even if cable TV punditry had never been born and there were no such thing, there would be intense public interest in a criminal investigation of one of the two candidates for president of the United States. INSKEEP: But this is a thing that is on my mind based on what you write. You write that you thought it was ridiculous - that's your word - that Bill Clinton would walk across an airplane tarmac to say hi to Loretta Lynch in order to influence the investigation in some way, but that you changed your view after cable TV pundits made a big deal out of it and that that was part of your thinking. Would it perhaps have been a better course of action to resist all that shouting out there and do something closer to what you would normally do? COMEY: Look, I meant what I said earlier. A reasonable person might have done that. I think that would've been a mistake. INSKEEP: As he talked with me and our colleague Carrie Johnson, James Comey made it clear that his overriding concern was protecting his institution. JOHNSON: With respect, sir, was that your job? Was it your job to worry about those things? COMEY: Oh, I think so. As the director of the FBI, I think my job is to worry about how the - despite what your mother told you about not caring what other people think, as the director of the FBI, the public trust is all you have in that institution. And so, yes, worrying about that had to be part of the job. INSKEEP: What is the difference between the Clinton email revelations in October just before the election, which you talked about, and the Trump and Russia investigation of the same period, which you chose not to talk about in any way before the election? COMEY: The answer is complicated, but I'll try and be as tight as I can about it. The policy with respect to investigations is, we don't comment about pending investigations. We don't even confirm their existence unless there is an overriding public interest and there will not be jeopardy to our investigation from abiding that public interest in making a comment. Hillary - and so I think, actually, the Russia counterintelligence investigations and the Clinton investigation illustrate the rule, believe it or not. INSKEEP: So here's what Comey says the difference is. The public knew of the email investigation from 2015 onward, which forced Comey to say the result. Having commented once, he says he had to comment again in October right before the election. That's when the FBI found a computer linked to an ex-congressman that might or might not have contained missing emails. By contrast, Comey says, the Russia probe was murkier. COMEY: We didn't know what we had. When people say, you should've said more about the counterintelligence investigations, what exactly would we say? You're going interrupt, Steve, aren't you? INSKEEP: I'm about to interrupt that. When it came to Hillary Clinton's email, the discovery of more emails possibly in Anthony Weiner's computer, which led to the public statement there, you also didn't know what you had. COMEY: Correct. I didn't know what I had, except I did know this from the investigative team. It's October the 28th. We're standing there about to get a search warrant, which the Justice Department agreed we'd need to get, for hundreds of thousands of emails, including emails that may change the case. You have told the American people you're done in the summer of 2016. That is not true anymore. And so what are your options? Our tradition - we take no action if we can avoid it in the runup to an election that might have an impact. So where's the door labeled no action? As I saw it, there were two doors, and they were both actions. Do I speak about this or do I conceal it? If I speak about it, it'll be really bad. It could have an impact on the election. That's a terrible thing. What's that other option? Conceal it - in my view, would be catastrophic. INSKEEP: Former FBI Director James Comey, who says he hopes his actions were not responsible for electing Donald Trump. And his new book is called "A Higher Loyalty." Transcript provided by NPR, Copyright NPR.